Guest Post by Milja Milenkovic, community manager at DesignAdvisor.Net: The colors you choose for your podcast cover art can greatly influence listeners’ first impressions and could even affect whether someone takes the all-important step and presses “play” in the first place. You might be thinking, ”Podcasts are audio, and the minimal visual aspect is not the main point at all so why bother with it?” The very fact that the visual element is so small means that you need to make it count! What Kind of Message Does Each Color Convey? Human beings are such visually wired creatures that even the small bit of cover art on your podcast can set the tone for the listening experience. Various color choices can trigger a whole host of different emotions and convey different meanings to the observer. The impact on color is more significant than most people realize. In fact, Design Advisor claims that 62-90% of product assessment is based on color alone! 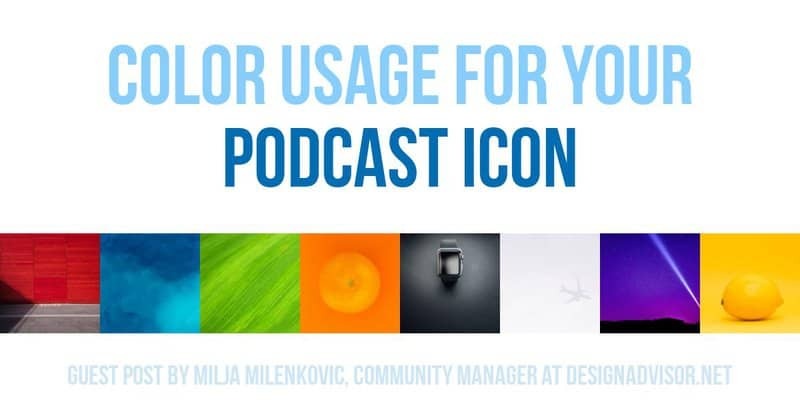 So let’s take a look at how you can enhance the impact of your podcast through the colors you use for your icon and podcast cover art, and even your website. First, we will break down the messages conveyed by each color and follow that with a few questions you should be asking yourself when deciding what colors will work best for your particular podcast. Color psychology can be a significant ally in web design as well not only in terms of aesthetics and mood but also when choosing the color of CTA buttons and other elements. To learn more about how the psychology of color can boost your website conversions, take a closer look at the infographic below. This calm and peaceful color gives a sense of health and harmony, but also symbolizes nature and growth. Depending on the topic of your podcast or business, green could be a great cover color to attract your listeners. It’s a popular choice within the energy sectors as well as finance, household, technology and some subsections of the food industry. There’s a reason why they say ‘true blue’ for something that is tried and tested. Blue is a tranquil color that is a worldwide favorite across the board. If you want to send a message of stability, reliability and trust, you can’t go wrong with blue. Remember, there is a myriad of different shades of blue available, so don’t be worried about not standing out. There’s no denying that red stands out. That’s the reason it’s used for anything from clearance sale signs to stop signs. The sight of red has also been shown to increase people’s heart rates, and it is undoubtedly the color of emotion and passion. If the content of your podcast is bold and passionate, maybe red is the right color for your cover design. Orange comes between red and yellow on the color wheel and is a warm and enthusiastic color. Orange gives a feeling of confidence and is said to stimulate the logical areas of the brain and also to encourage creativity. It is a favorite with kids and young people, as well as those who are young at heart. This warm and cheerful color has a powerful effect, especially when set against a dark or contrasting background. Yellow stands out in the crowd and works well for the food industry, household and energy sectors. It is a symbol of joy, cheerfulness and optimism. The color of kings and queens, purple is indeed associated with royalty and wealth. It is a favorite in the beauty industry and for anti-aging products. Purple suggests eternal youth and wisdom, with a whiff of mysticism. Does the message of your podcast fit with this image? Then perhaps purple is the color for your cover! As a lighter shade of red, pink is also a passionate color, but with a much softer touch. There are many different kinds of pink, from pastel salmon to bright fuschia. In color psychology, pink denotes compassion, nurturing and hope. The feelings which tend to be evoked by the color pink are usually positive, warm, comforting and calming. Silver and its close cousin grey are very useful as neutral colors that bring balance and give that sleek accent, much like the proverbial silver lining. Silver and grey can be beautifully matched with just about any other color. Black is in a class of its own. It speaks of luxury and elegance, as well as power, authority and strength. If you want a professional and timeless look to your podcast cover, you might want to choose a simple black and white design. White is such a versatile and useful color, whether you use it as a background for your podcast cover art or as part of your icon. White gives a fresh feeling of cleanliness and perfection, and can also stimulate creativity. What is the topic of your podcasts? What are your podcasts about? What is your message and what industry or sector do you identify with in terms of your product or service? Given the above basic messages associated with the different colors, which one most closely fits for you? Do you anticipate that most of your listeners will be men or women, wealthy or budget conscious, professionals or amateurs, younger or older folks? Bear your demographic in mind when making color choices as different groups of people tend to respond differently to colors. Do you have a logo or brand color? If you already have a logo or brand color, then you are more than halfway there. Let your listeners identify you immediately when they see your logo. Make sure that the format you use for your podcast cover art and icon will look good on any platform you might choose to use. Once you’ve identified what your main color should be, you may want to add an accent color or two. You could choose a shade or tone of the same color, or go for a different, complementary color. Try to limit yourself to no more than three colors to avoid an over-the-top appearance. What kind of impression does the overall look leave? With the limited space available for your podcast icon, you need to make sure that your overall look is not cluttered or messy. Keep it clean and simple with fonts and images that stand out, are easy to read and recognizable. Now that you have some ideas and pointers about the power of color in visuals, it’s time to choose that icon and cover art for your podcast! Let them be a fitting visual complement to your amazing audio content! Spotify is well on its way to becoming the Netflix of podcasting. They single-handedly propelled the business of podcasting into the big leagues this week. Spotify announced they are planning to spend a cool budget of $500,000,000 (That's 1/2 a billion!) on podcasting acquisitions. For starters, they purchased Gimlet Media, reportedly for some $230M, as well as the Anchor podcast platform for $60M. From the Spotify perspective, I agree with the analysis of the Wall Street Journal and others: This model means a focus on premium content and acquiring exclusive podcasts only available on Spotify. I think this theory covers both Gimlet as well as Anchor acquisitions. Does Netflix of Podcasting Imply Exclusive Content? I could see that if their strategy succeeds, exclusive versions of the best and most desirable podcasts may only be available on Spotify, driving new subscribers to their overall platform. So yes, I anticipate that Gimlet Media will produce some bespoke content for Spotify. But I also I think there are a lot of variations on how this could play out when it comes to exclusivity – for example offering ad supported versions of exclusive podcasts outside of Spotify, meaning iTunes and elsewhere. The Future of Podcast Monetization? Also, I would predict that podcast hosting, ad platforms, monetization and reimbursement models will be routed through Spotify. Could they be going for a model of reimbursing premium podcasters as they currently reimburse musicians? This could mean a democratized monetization model for mid-level podcasts, with micro payments to podcasters that are not currently commanding enough downloads to easily run ads inside their shows. I see this as a positive alternative for podcasts that don’t have any monetization options outside of Patreon. However, the emphasis being on MICRO-payments, as in “Podcasters, don’t quit your day job”. I am also wondering if this is symbiotic with Apple and iTunes, or competitive when it comes to discoverability? Will Spotify finally be able to break up Apple’s quasi monopoly in the podcast discoverability space? Just considering my own behavior: I happen to have a Spotify music account. I NEVER search for any music on iTunes anymore. I search in Spotify directly. So just imagine a future to where Spotify would be the first place to search for interesting podcast content to listen to. If you want to be the Netflix of podcasting, you need content. Content you develop, or acquire. My understanding is that Anchor owns the podcast content hosted on their platform, and so I am assuming that with this acquisition Spotify will acquire direct ownership of a massive amount of transitioned podcasts, leaving them to be able to decide on monetization and subscription and discoverability models. From the Gimlet perspective, this is the best exit their investors could expect now or in the future. In my opinion, I think there may also be an opportunistic element for Alex Blumberg to get his life back and move forward in the best possible way. I imagine him being able to move towards more fun and meaningful opportunities within Spotify. Gimlet with its storytelling chops should be the perfect podcast content strategists. I think Alex and his team could be focused on developing interesting content – rather than Gimlet being a money making entity beholden to investors. One of the most compelling aspects of Startup as a podcast has been the intimacy of sharing of his journey, including the stress on work life balance. Listening to the last few episodes of that, combined with the show WithoutFail, it seems like the stress levels have not lessened, so with this exit perhaps the pressure from keeping investors happy will be eased. I am again speculating for now, and I think the picture will become clearer over time. But yes, Spotify's CEO Daniel Ek's $500 million budget leaves room for additional deals. In addition to new acquisitions of podcast networks and content I would not be surprised if Spotify will also start to acquire podcast specific technology and ad platform companies. Not naming any names at this point. And rumors are afloat that Netflix might acquire all of Spotify. So as a podcast producer, how do I feel about this all? I think any movement within the podcasting industry that rivals Apple, or makes them move a bit faster on the innovation front, is a good thing. In this season we have occasionally touched up our own podcast workflow. For those of you who follow us, you realize that we often talk about “podcasting as a content strategy”. So as we approach the end of season 1 of our Podcast Growth Show, I thought it was time to zoom out for a big picture episode. Basically, this episode is our blueprint to go from podcast content strategy to execution. So I’d like to reveal our overall podcast workflow, all the way from strategy to execution. And in this episode I’ll reveal all our little secret tips, tricks, tools and gear we use to save massive amount of time along the way. For both new and existing podcasts, it is good to start with the end in mind, to have clarity about your audience, as well as confidence that the value proposition for your listeners, as well as the reason why you are doing a podcast is clear. A lot of people just want to get started and hit the record button already. But unless you already have a dozen or so episodes under your belt, you will discover that there is a lot of planning involved. Especially if podcasting as content strategy is something even remotely on your horizon. I talk to new podcasters all the time, and some get lost in the planning stage. Let’s discover how having a planning framework helps us retain clarity. I’d like to go into how we approach podcast production ourselves. This is only one of many possible ways, and in no way am I suggesting you should adopt our methods. There is a lot involved, and it can sound scary. We tolerate an amount of complexity because it produces results for us. And complexity doesn’t mean things can’t be automated, simplified or even outsourced. Both complexity and simplicity can co-exist. For us, it’s the results that count. This entire season has been about how to promote a podcast. So we may already have covered some of the methods we use to promote each episode. I’ll keep that segment short. We like the concept of seasons, as it provides some amount of flexibility when thinking about the overall goals for your podcast as business content strategy. Do we have a solo show or an interview based show? Do we have a co-host? Does our podcast have a theme? Would we like to try a different episode structure? Are we afraid your audience is getting bored with our content? What if we want to change up? Or are we suffering from “podfading” and just plain tired and need a break? I know a lot of podcasters who just barrel on producing episode after episode without ever pausing, re-thinking, changing direction or taking stock. There is nothing wrong with that, as long as the audience is with us on this. Periodically revisiting the value proposition of our podcast is an excellent habit. But just how we do that? We have developed a process for developing a podcast’s branding and value proposition. This Value Proposition Design (VPD) process is driven by over a hundred trigger questions designed to achieve clarity about our audience. To be more specific, clarity about what our listening audience is experiencing, what problems we help them solve or wrestle with, and what goals and transformation we help them achieve. Not only that, there are also over 100 trigger questions to get us to think about how well our podcast topics match up to our audience desires, needs, tasks and expectations. We have online forms for these trigger questions, and the answers we produce during this process are worth their weight in gold: They become a rich source of podcast themes, episode topics, SEO keywords, episode titles. This clarity is what you can when going through the VPD process. It is also important to keep focused on our podcast goals, and to periodically revisit these. Perhaps we started out just wanting to have fun and get our message out to the world, but now we are finding ourselves wanting to build a list, or speak on stages, or to use your podcast as a vehicle to help promote a book. These are significant shifts in goals, and require significant adjustments to the way we utilize and market our podcast. Of course none of this has to do with the week to week podcast workflow of producing episodes in the middle of a season. Why do we do SEO research for something audio based? Our own podcast website gets 65% of subscribers from SEO search. 50% of my new clients come from search. Our podcast is less than 2 months old at the time of this recording, and has yielded 4 new clients and many more prospects. Not from iTunes discoverability, not referrals. So our entire podcast workflow is based on solid SEO research. You may think that this is all overkill. And again, I will point out that this is just the process we follow because it works for us and our results speak for themselves. BTW, we have a whole course on podcast SEO. So the assumption is that we do have clarity about our goals and value proposition for the audience. At this point, we want to identify potential SEO opportunities and turn these into topics for our season long episode plan. The goal is to be able to rank for our show notes pages. If we target obscure keywords that no one ever searches for, we may rank on page one of the search results, but no one will ever visit our podcast from that. I myself may have a bit of an unfair advantage, because Polymash started life in part as an SEO agency. So we have access to some enterprise level SEO tools. But the good news for podcasters is that there are affordable and even free tools out there to do the same thing. So here is a quick demo (at 13:50 ) of how we identify high opportunity keywords using Mangool’s SEO suite, particularly the KWFinder utility. This is a central part of our podcast workflow, and KWFinder is by far my favorite and simple to use SEO keyword research tool. We have coached a ton of podcasters to use it to good effect. 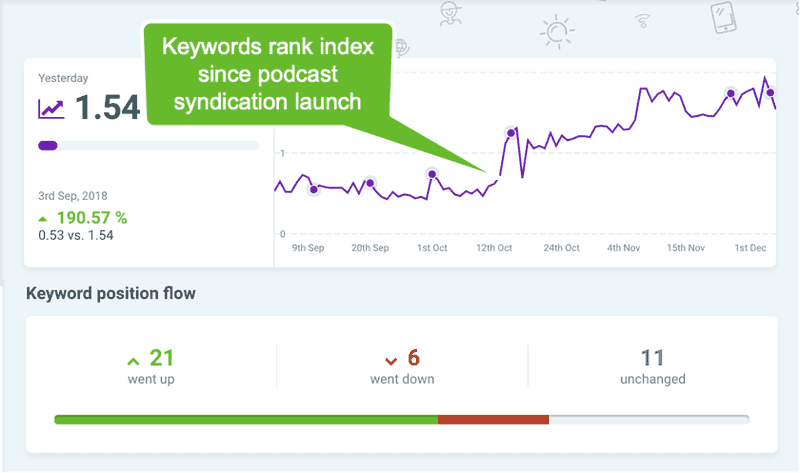 KWFinder: Our favorite keyword research utility for podcasters. So in the podcast workflow, once we have identified a list of keywords with potential, it is time to take these keywords and base our episode plan on these. Each site has something called Domain Authority and Alexa Rank, which indicates how likely the site’s content will rank on Google. This means every site needs to target keywords that are commensurate with their Domain Authority and Alexa Rank. For old, established and popular sites it is easier to rank for more difficult keywords. But new site owners with low DA and Alexa rank need to choose key-phrases they can actually rank for. The formula we have developed matches the domain authority of any site with the keyword difficulty to target on KW Finder. This is all about prioritizing high opportunity topics, from high opportunity keywords. We have developed a Google Sheets template to help map this out. Here is the process we follow to identify episode themes and topics based on our Podcast SEO research. As I mentioned earlier, we base our podcast episodes on our prior SEO research. By the time we are mid-season, we usually have a range of potential topics for a season to choose from, and hundreds of potential SEO keywords to choose from as well. Initially we develop working titles for each episode before we even incorporate relevant SEO keywords from our list. But at some point it is important to design episode titles with relevant keywords that fits the topic, and that are commensurate with the ranking power of our site as well. The exact wording of our episode titles is more important than many podcasters realize. You can have a great episode, but if the title is not compelling, click worthy, interesting or thought provoking, people will never click through. Sure, your existing subscribers may listen. But this is about attracting new listeners and subscribers. Just think about where your episode titles appear, and what role they play in your podcast workflow and the way people consume podcasts. People may see your episode title on their iPhone or listening device of choice. Will they be interested enough to tap and listen? People may come across your show notes and episodes as a result of a Google search. But will your episode title be compelling enough for them click through? Your episodes titles may appear on social media, Facebook, Instagram, Twitter. Will it arouse people’s curiosity? So what makes a click-worthy episode title? There are a bunch of tools out there that help, for example the CoSchedule Headline Analyzer. CoSchedule is a well know the social media scheduling platform we use, and they have developed a wonderful tool for designing highly converting titles for blog posts as well as for podcast episodes. The tool is free, and you can try it out here. Their recommendations are based on a ton of research, word usage and title patterns proven to be successful on social media. Their algorithm checks for the presence of unusual words, power words, emotional words and the structure and length of each title. Of course, fair warning: Don’t become a slave to such a tool. But my point is more about following this thinking process and formulating a range of potential titles. I guarantee you this: If you formulate only a single title for each episode, it will never be as good as if you formulate 7+ titles to choose from. So it is making this discipline part of our podcast workflow that makes all the difference. For us to stay organized and to collaborate on SEO research as well as podcast topic and title planning, we again use our trusty Google sheet template to stay organized. OK so we’ve finally gotten closer to actually recording an episode. Our own podcast’s current season is a solo recording effort. If you’ve listened to our previous episode “How To: Easy Podcast Distribution And Content Syndication [S1E08]“, you would have learned about the StoryChief app we use to distribute our show notes to more than 16+ platforms. But we also use StoryChief to develop our solo episode scripts. This saves us a lot of time later, after the recording process. And because this season is video based, the podcast workflow to incorporate video is by nature a bit harder. Beyond this it’s 5 stories for 10$/month, 10 stories for 20$/month, 15 for 30, 20 for 40, 25 for 50 up until 30 for 60$; and 20% discount if you pay yearly. Google docs are great for collaboration with clients, and we have designed our template to work for preparing, ID3 tagging, and creating show notes. Our episode preparation template on Google docs that works for solo, interview or co-host driven formats. We also use this for our own podcast, but that is for capturing titles, descriptions, video metadata, ID3 tag information, embed codes for the episodes once everything is done. This season combines an audio podcast with a video tutorials, demos and more. Because we cross publish each episode to our YouTube Channel as well, it is important to formulate the YouTube tags, description and links for each episode, and again our template allows for this. Finally, after all this planning, we are ready to record something. ScreenFlow launched an innovation this year that I had been looking for a long time. It automates the production process with the ability to configure recording templates. These templates then place your video into a template with a pre-existing intro, outro, lower thirds, resizing and repositioning the webcam image as a picture in picture on the screen. If you click play on the video above, you can see the effect. After the initial setup of my YouTube channel, I do nothing more to produce these videos, other than to press the record button. Clever, no? You might also have noticed that in my opening sequences I talk directly to the camera. Hopefully I come across as fluent in these videos, but what you may not realize is that I’m assisted by a mini teleprompter attached to my webcam. My scripts live on an iPad on my desk, which I can speed up or slow down as I record. It’s a strictly one man operation. The actual teleprompting screen is driven by my iPhone, and all of this allows me to look directly into the camera as I record my episodes. If you are curious about this setup, below is an (affiliate) link to this amazingly small and affordable teleprompting device. We use a compact, versatile, and easy to use teleprompter that helps us quickly deliver polished show notes to our listeners. Until now, teleprompters have been clunky, expensive, and difficult to operate–and many required film studios or a production team. This teleprompter changes all of that. 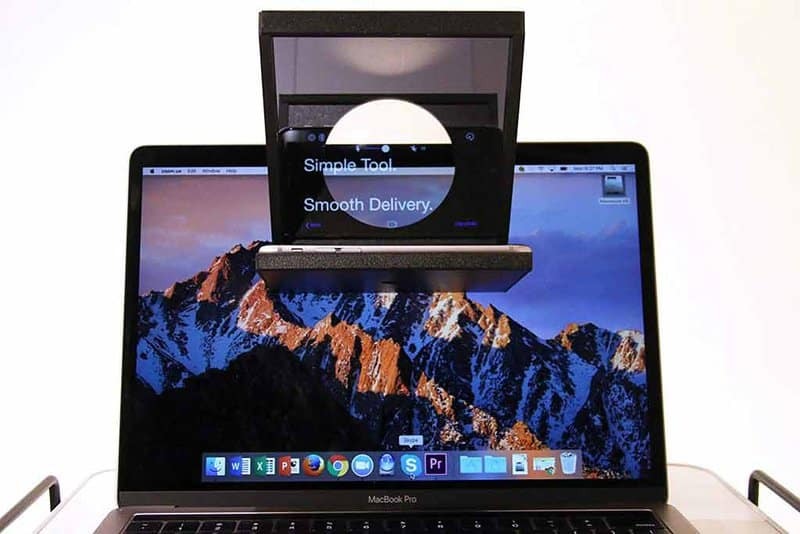 It’s a simple tool that helps us nail smooth delivery using just a smartphone and our desktop computer, DSLR, or webcam. One issue with doing a video podcast, especially one where one stands or moves around, is audio quality. While sitting I can use my microphone and arm easily, but if I’m standing or moving around I like to use a wireless mic. This is also true for general video production or conducting on-camera interviews. I really did a lot of research before investing in this piece of kit. What we use is what I feel is the most affordable and yet high quality pair of wireless lavalier microphones on the market. I think the quality is as good as the famous Sennheisers, but the price is 1/2. The system is called the COMICA CVM-WM300(A). There is also an optional interview mic to take this setup on the road and conduct amazing mobile podcasts and or video interviews. Again, if you’d like to check it out, below is an (affiliate) link. We produce our client podcasts using a professional audio editing platform called Adobe Audition. One of my favorite things is when podcast clients comment on how amazing they sound on the podcasts we produce for them. But it is also because Adobe Audition comes with some professional and sophisticated tools to help us shape a warm and inviting sound profile for each podcast host of guest. So far, so good. But when recording video as well as an audio podcast, things become more complicated. And time consuming. Loopback to create virtual audio devices to take the sound from apps and audio input devices, then pass it to any audio processing software. Audio Hijack, which functions like a real-time, virtual mixing console with EQ, compression and noise gating built in. These 2 apps allow me to apply sound profiles in real time. Ordinarily this is done with a mixing console or in post-production, but this happens live. So the final video has that “broadcast” ready sound as it is being recorded. The other advantage is that I can create profiles to attempt to make my lavaliers sound the same or similar to my Heil PR40 mic. (I can hear audiophiles groaning now). But at least I can get similar sound quality. We use the Wondershare Video Converter app to extract a high quality audio file from the video. This automation saves us at least 20 minutes per episode. So now we finally have the .mp3 file to upload and release on our podcast hosting software Libsyn. First we apply the episodes title, descriptions and other podcast metadata to the .mp3 file. Then we upload to Libsyn and schedule the episode to go live at the desired time. Remember we are using Screenflow to record our video content. It has the built in ability to export each video to our Youtube channel, including custom thumbnails, tags, descriptions and links. So the video portion of our podcast was already uploaded and scheduled on YouTube in a previous step. A critical step in our podcast workflow is to distribute and syndicate our show notes to as many platforms as possible. After all, our podcast’s audio files are being syndicated to be available in iTunes, Stitcher, Spotify and Google Play. Content syndication with StoryChief is to show notes what RSS feeds are to your podcast audio. Because we prepare our episode scripts in StoryChief, by the time we record our episode the show notes are 90% written already. So all that’s left is to embed the episode video into StoryChief. We love StoryChief as a content syndication in part because it is podcast ready. We easily embed the Libsyn player widget into our episode to allow site visitors to choose their modality: Read, Listen or Watch. Another reason we love StoryChief is that it allows for embedding various lead generation and email capture widgets. So if our episode has a “Lead Magnet” like a bonus guide, mind-map or check-list, we embedding it right in the StoryChief show notes. In an upcoming episode I am planning to go into detail about how we create a 1/2 year long automated campaign to promote each episode on social media. Over the years we have tried and used a ton of different platforms for this. The one I think is most innovative is called CoSchedule. It allows us to design a social campaign on autopilot. I answer every RT, question or DM related to our podcast episodes. But that does not mean I want to spend a lot of time on social media crafting individual tweets and social shares for our episodes. CoSchedule has a clever automation concept called “social helpers”. These are content snippets that help to produce a varied social feed, with different hashtags, images, messages. It shares our episode show notes content, but does not repeat the same tweet or image all the time. Again, it’s the sort of one time up-front effort that takes some time to set up initially, but then saves a ton of time for each episode. If you are interested in seeing this in more detail, let me know in the comments. Again – this episode was just the process we follow because it is producing results for us. I do not recommend it to everyone, and the fact that we are producing video alongside the audio portion complicates things a bit. If you are a new podcaster or a business considering podcasting as a content strategy, you may well think all of this is overkill. But keep in mind that the lion share of the work goes into the initial planning, the setting up of templates and designing and implementing the various automation steps. And this is a one time only effort. And the routine production can be done by other people. If you’d like to chat and explore possibilities for your own podcast workflow, feel free to book a time with me. You may think running Facebook Ads would be an excellent vehicle to promote a podcast. Facebook ads allow you to precisely target your audience amd promise to increase your subscribers in a cost-effective way. And I totally agree. Facebook is the best paid promotion platform for a podcast, our regular listeners may remember Episode 3 “Paid Podcast Advertising – a Look Behind the Scenes“. My point with this episode is not to argue that Facebook is a poor platform to advertise podcasts on. Rather to point out that the Facebook Podcast Promotion Process most bloggers and marketers recommend it is flawed. So what’s the problem with using Facebook Ads to promote a podcast? The issue has to do with where to send traffic once someone clicks on your Facebook ad. Many marketers recommend promoting Facebook episodes by directly linking to the iTunes or Android or Spotify episode pages. And we see many podcasts following this advice and missing out in the process. Sure, your ads may get you more listeners for your podcast on iTunes and Stitcher. But Facebook podcast marketing ads should also have a better goal in addition to just adding listeners. Because the cost per new listener is usually quite high. Instead, you could be getting greater value and ROI from your Facebook ads by focusing on lead generation and list growth. Instead of on just getting more listeners, you could be adding leads for your business, building your email list, increase the rank and traffic for your site, and building a digital asset for your brand. You are paying for ads traffic that you are sending to iTunes and Google Play Music. Instead, your own site could be benefitting from greater traffic, rank, and authority. Would you go on a date without ever asking the other person’s name? Don’t let your site visitors and podcast listeners stay anonymous. That’s like going on a date without ever asking the other person’s name. iTunes and Facebook may know who your listeners are. But they won’t let you, the publisher, in on that secret. You won’t know how many listeners subscribed to your show on those platforms. More importantly, you don’t know whose these listeners are. Since you are not capturing their email address, you have much less of a chance to engage with them. Even if they are big fans of your show. If you don’t attract listeners to visit your show pages, you are essentially going on blind dates – without ever even asking for a name. So, a very passive way to promote a podcast. Instead, your podcast listeners could be coming to YOUR site, because you offer valuable additional episode information there. They could be signing up to receive podcast notifications via email. They could discover links and resources about your guests. And they could be downloading relevant resources from you in exchange for an email address. So, when recording your podcast, make sure you mention an easy to remember episode show notes link like “mypodcast.com/132”. Mention this often, for example at the start of the show, create your own mid-roll segment inviting people to visit your site, and include it again in the outro. In my opinion, too many authors, speakers, entrepreneurs and small businesses spread their entire online presence across 3rd party platforms. They want authority and recognition in their space. But are also conscious of the promised audience, engagement, ease of use and time savings these platforms promise. …the distribution of production into the hands of the many – but the concentration of the economic rewards into the hands of the few. So, what we often see with new clients who come to us for help is this: They post all of their valuable intellectual capital and thought leadership content on platforms like Medium, LinkedIn or Facebook. Their videos can be found only on Youtube, their podcasts episode only on Soundcloud, iTunes or Stitcher. In other words, on platforms they themselves don’t own outright, but platforms that have a built-in audience and engagement. I am not proposing to avoid these platforms. However, I am saying that all social and ad traffic to promote your podcast should land on your own great conversion optimized podcast home page. We recently published a video walkthrough which showcases a highly converting podcast website design pattern. It is called “The Upside Down Podcast Home Page”. The effort (or cost) involved in creating a podcast home page and maintaining your podcast show notes are well worth it in the long run. The time spent pales in comparison to the effort of actually creating your content in the first place. Your content should live on your own site FIRST AND FOREMOST. Only then should it be shared from there centrally, spreading out to 3rd party platforms for social engagement. Especially if you are using Podcasting as Content Strategy. We call this process “Outward Syndication”. Many podcasters build their own system for sharing new podcast episodes once they are published. The process we follow for our clients cross promotes their episode show notes posts gradually, across a range of platforms. These syndication channels include Youtube, Medium, Blogger, Facebook Groups, Facebook Pages, Linkedin Personal pages, LinkedIn Business Pages, Google Plus, BeBee, and other social networks. Before episodes are promoted on any 3rd party platforms, we want to ensure that the show notes page goes live on our own site first. And that our own episode page gets indexed by Google first. We don’t want to search for our episodes online only to see our medium article pop up in the search results. Therefore we use a “rel=canonical” tag to indicate where the original article lives. This is true to Google, Bing and other search engine crawlers as well. There are several ways to do this and to ensure our episode is indexed on our own site first. First, we can use Google’s webmaster tools (AKA Google Search Console) to manually submit our episode post for indexing. This is quicker than waiting 2-3 weeks for Google’s crawler to come around and visit your website. Typically we do this the day we publish to instantly be included in the search results. 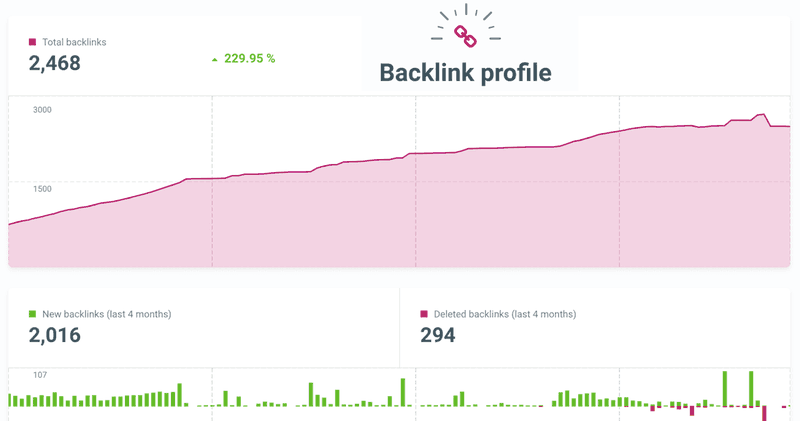 We discuss the importance of SEO based podcast cornerstone content strategy elsewhere on my blog, but we have seen episodes rank in the top 30 results within a week using our approach. So it is only after that has happened that we publish and syndicate on other platforms. Getting back to the “rel=canonical” setting when publishing on other platforms. Take Medium for example: It is very important to use their own content import tool, which uses the “rel=canonical” tag and honors the original source of the article and channels the Google rank score to that original post. So do not just copy / paste your episode show notes into a new Medium article, use their import tool. Automatically applies the “rel=canonical” settings when publishing on other platforms. There is a one-time up-front effort in setting up multiple platforms to syndicate to, but promoting an episode to multiple platforms with built in audiences like Medium makes this worth it. Having your own SEO optimized podcast show notes pages builds a much more valuable asset on your site, audience, and email list. Would you not rather build free traffic and rank for your site? Don’t overlook the value of SEO for your show notes pages. This is one of the deadly podcast marketing sins I often write about. I think most marketers would agree that an email list is still the most valuable asset to build for your digital presence. How do you measure your investment in Facebook ads? Success = how many people SIGN UP for your podcast or blog. The Facebook marketing term for this is called a “conversion”. It is NOT how many people clicked on your ad, nor how many more anonymous listeners you might be getting on iTunes. Before running ad campaigns on Facebook, you get to decide the “Goal” of each ad campaign during the setup process. Simply measuring “clicks to a website” is the weakest form of available analytics. Yet this is the only goal you can use when sending traffic to iTunes or Stitcher. Facebook ads cannot measure who subscribed to your podcast on iTunes or Stitcher. Facebook won’t know if they listened to an episode after clicking on your ad. So how do you optimize or test your ads? If you are sending your ad traffic to iTunes and Stitcher as proposed by many marketers, then the only way you can tell if these ads are even working is to see if your Libsyn or Blubrry stats increased during the time you ran the ad. And of course, even then you don’t know the identity of the people who subscribed. So don’t set this as your Facebook Ad campaign goal. Facebook algorithms are more effective when optimized for conversions. When setting up an ad campaign on Facebook, you can choose “conversions” as the goal. A “conversion” is triggered every time someone goes to your podcast subscriber “thank you page”, so you will need one of these on your site. If you use Facebook to boost or promote your podcast, don’t send traffic directly to your episode pages on iTunes and Stitcher. Instead, send traffic to your own episode show notes pages. Be sure your site features a “subscribe by email widget” that redirects to a thank you page, and triggers a “conversion” on Facebook. Today’s episode is a little different. We are going to talk about the importance of building a great podcast home page, and the role it plays in promoting your podcast. Let me apologize in advance: Talking about podcast homepage design patterns is a mostly visual exercise. It you are listening and not able to see the video and the show notes, I’ll try my best to verbally explain the page layout elements as we go through. But the episode features a YouTube video where you can see the visual bits explained in detail, and I’d encourage you to watch it above. What we are talking about is a highly converting podcast homepage design pattern called “The Upside Down Podcast Home Page” – optimized to create a guided experience for your site visitors, and to encourage them to subscribe to your podcast via email. 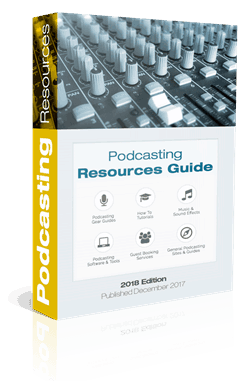 The video covers 2 versions of this – a more complete version for established podcasts with multiple seasons or topics, and a simple version for new podcast sites with a narrow niche and a focused audience. But first I want to outline the reasons behind focusing on email list building instead of on iTunes rank and “New and Noteworthy” presence. I get asked about this a lot, especially by “podcasting purists” and “old school” podcasters who are experienced and may already have a solid audience and following. For them, understandably, the primary goal is to serve listeners on iTunes. The holy grail of podcasting is to get iTunes Subscribers, right? And to get into the “New and Noteworthy” charts, right? And so podcast homepage design should focus on getting visitors to your site to subscribe on iTunes, right? Well, not from my point of view. For a number of reasons: The iTunes podcast ranking algorithm as well as the “New and Noteworthy” charts are seriously broken at the time of this writing. The top 200 podcasts are being gamed and exploited, and are full of entries who are paying thousands of dollars to overseas click farms for instant presence in the top charts. This is not just my opinion, but has been extensively covered in the podcast news beats. If you want to see a comprehensive video explaining how this is the case, and what the impact on the iTunes ecosystem is, just watch this video by Lime Link. So why design your podcast website to get people to subscribe on iTunes, when you could be getting people to subscribe to your podcast via email notifications? I would gladly trade 1,000 iTunes subscribers for 100 podcast email notification subscribers. Email list building sounds like such a trite concept, but even today it is still one of the most valuable assets your business can build. The fact is that you can provide your audience with more valuable context, and you get to better position your episodes through the email notifications you send. Should you still encourage your listeners to subscribe on iTunes, Google Play or Stitcher? Of course, but it is better to do so after they have opted in via email. “Conversion Optimization” is such a crass term. Sounds vaguely exploitative, like you are somehow tricking or taking advantage of your audience. Let me try and debunk that. The “Upside Down Podcast Homepage” design pattern is intended to better serve your audience. It is meant to create a better experience for them. It is based on empathy with your audience. Your podcast homepage design should be intended to help your audience discover your best and most relevant content. Content that resonates the most with their own situation and listening goals, and is also what you are most proud of. And so, the intention is to create a guided experience for your visitors. This means hiding distractions, and reducing some of the options that some visitors may be accustomed to. For example, the presence of a comprehensive menu with lots of choices at the top of the page. Or buttons to jump off to iTunes and Stitcher where they can simply subscribe. From a UX perspective, you may think these make it easier for your visitors, when in fact they can create cognitive friction, overwhelm, and too many choices. The idea is not to make it “harder” for your visitors to find these links, but to simply guide them on a journey to better understanding your topic, how your podcast addresses their own needs, and how best to stay connected with your content. None of this can happen if you “make it easy” for your site visitors by placing a “Subscribe on iTunes” button on the top of your site. That just sends them straight to the iTunes store, where they will see a homogenized list of episodes with no context, no background story, no differentiation between one episode and the next. The subscribe on iTunes links are still there, of course, but placed near the bottom of the page. This means as your visitors scroll through your podcast website, you have the chance to encourage them to discover your content and subscribe to your show via email. Again, apologies for the visual nature of this, but what follows will talk through a number of website design elements called “page sections”. These are the building blocks of modern web design. They can be thought of as horizontal bands of grouped content. Most of us are familiar with websites that have a “Header” or “Above the Fold” or “Hero” page section. Well, there are other less prominent sections as well, and we’ll talk through each one involved in the “Upside Down Podcast Homepage” pattern. positioned in the upper half of a web page and visible without scrolling down the page. The above the fold section is the first thing that creates an impression when we visit a site. It is often where we find a “Header” or “Hero Image”. The top of the page should be dedicated to one thing: getting people to sign up to your podcast via email. Look Ma, No Menu: This is what makes it an “upside down” page. Menu links are moved to the footer instead. If you must have menu items, limit them to 3-5. Call To Action: Deliver a solid call to action above the fold, but make sure this is NOT an iTunes button. The social proof band establishes you’re not a weirdo, and if possible outlines your best reviews, or that your podcast was in the top 100, or that you’ve been featured elsewhere, including on TV, or even if you’ve appeared on other podcast shows. It is often implemented as a set of light grey logos where you might have been featured, or can include testimonials from your guests. The design reason for “greyed out” logos are that they are a more humble brag, and less likely to visually compete with the design of your site. In our video, notice the design treatment for this section. The roadmap section provides an multiple choice on-ramp to let your site visitors self-select their journey through your content. It is most often designed as a section with a set of columns or content boxes with an icon, a headline, short description and a button to find out more. It provides an “at a glance” overview of your podcast’s content, while at the same time encouraging your visitors to select what they are most interested in. Clicking on your road map section represents a sort of “micro-commitment” to further engage with your content. A good example of a roadmap would be for guiding your site visitors through multiple seasons of your podcast. Each season would have a title, a description, and a button to find out more about it. A click on each button triggers a smooth scroll down the page to a pilot story section, which further explains the season and offers some of its best content. This sort of self selective exploration of your content allows your visitors to find what they want as well as stay on your site. SEO Tip: For extra credit, implement a WordPress plugin called “Reduce Bounce Rate“, which communicates with Google Analytics and records scroll movements. In our tests we have observed improvement in bounce rate from the 80s to the 30s. 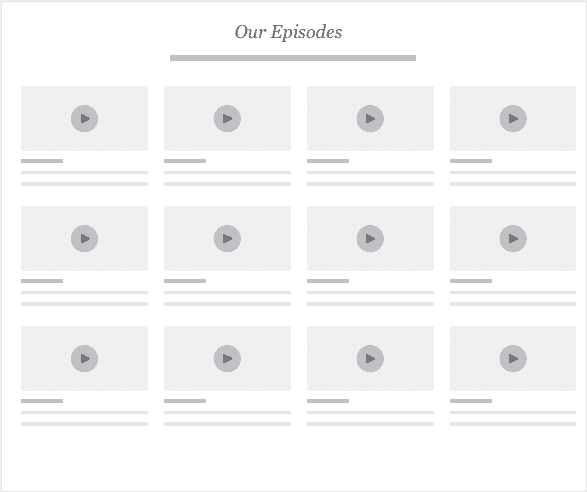 As covered in our video, there are multiple ways in which pilot stories function within your podcast homepage design to highlight your very best best content. If you have a single and focused niche you may only need a single pilot story. But if your podcast homepage design is intended to offer multiple categories of content, or multiple seasons, then you can add “Pilot Story” sections for each. For listeners unable to see the illustrations in our show notes, the pilot story section features not only the headline and compelling description, but also a mini grid of your best episodes on the related topic. Our own design approach is to split this page section vertically, with the pilot story on one side, and a mini episode grid on the other side. This allows you to highlight your best content, instead of hiding it deep inside your site. Use Google analytics to identify the best and most popular episodes from the past, and then feature them here. For people with seasonal shows, these sections can tell the story of each season. Having a section for each season provides you with a chance to outline the value proposition of listening to each season. It also lets you highlight the best and most popular episodes, and allows people to jump to the show notes pages for each episode that resonates with them. Another way to position the pilot story sections is to categorize your content. Does your podcast offer advice, or tips? If so, chances are that your episodes fall into multiple categories of advice and tips. You can develop a “Pilot Story” for each category, and highlight the best episodes for each. One thing all pilot stories have in common is that they offer you the chance to highlight your best content. And it also provides you with the opportunity to offer your audience a call to action. What is it you want them to do? The simplest way to implement this is to simply offer a way to subscribe to email notifications as a way to stay connected with your show. 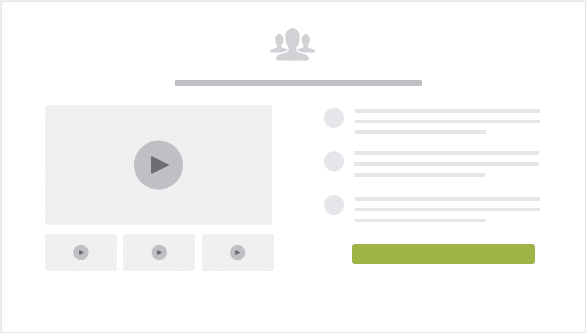 A more advanced call to action provides additional incentives to your audience. For an example of this, see season 2 of the Positivity Strategist Podcast. This podcast season talks about “Seven new literacies for living and leading in our times”, and the gift being offered for people to subscribe to the show is a “7 Literacies Guide” to go along with listening to the season. Associating your podcast homepage with strong calls to action also allows for utilizing paid ads and post boosts on Facebook and other platforms. And, make sure your podcast episode files use Facebook correctly and link to your show notes pages rather than to iTunes. Finally, here is the section about how to subscribe on iTunes or other podcast directories. This appears right at the top of the podcast home page in too many podcast homepage designs. The reason for placing this further down is this: By the time that people scroll to this section, your pilot stories have had ample time to communicate the benefits of signing up via email. Minor tip: If you use the icons and graphics provided by each podcast platform, consider adding text explanations under each graphic. Your readers might not recognize each graphic. Like the iTunes links, your complete episode grid is purposefully moved towards the bottom of the page layout. This so people are likely more likely to scroll and discover the highlighted episodes in the “Pilot Story” sections above. Most websites have their navigation at the very top of the page, but moving it to the bottom of the page, we have increased focus and conversions. If you are interested in a downloadable PDF version of this design pattern as featured and covered in the video with all the annotations and explanations, please click here to sign up for our podcasting resources guide, which features a PDF version of the entire design pattern with lots of implementation notes. Also, I am creating a “Done For You” version of this design pattern, ready to install on any WordPress site, let me know if that is something you would want in the comments. How effective are paid podcast advertising strategies, and do they work for podcasters trying to promote their show? Which ad platforms are the most effective? And which are the most affordable? We take a look behind the scenes of 3 platforms, Google AdWords, Facebook and Podcast Ad Networks. Using paid ads for promoting a podcast may not be for everyone. A lot of casual podcasters are in it just for the fun. If their show grows organically, fine. But spending money on ads is not something they’d consider. However, when podcasting is part of a business content strategy, then paid promotions seem to make more sense. It is an expensive way of getting new subscribers? Measuring the effectiveness of paid ads is difficult? Your ads may not even be reaching podcast listeners? I find that podcasting for business is more inbound than outbound. Successful business podcasts should offer solutions, solve a prospects problems or provide training and education. Thus they are extremely effective in building a brand’s authority. But Podcasts are not effective for direct response selling to cold traffic. If you are a business getting into podcasting as a way to sell something, stop. You might be better off advertising on existing podcasts in your niche. We cover this later in this episode. On the other hand, if a business has a good inbound content marketing funnel, podcasts can serve as a great entry vehicle. As a business podcaster you get to talk to your ideal and relevant audience when they are in a receptive mode. Think about what people are doing when listening to their favorite podcast, the one you are appearing on. They are likely commuting, working out, going for a walk. This listening modality is very different from interrupting an audience in the middle of browsing through their Facebook feed. So the “getting to know, like and trust” factor is huge in podcasting. And this is why Podcast Listeners are such a lucrative audience. You get to offer solutions, entertainment, education – and present your core ideas to them. But this takes the vision to invest in a longer term “inbound” strategy. Podcasts result in exceptionally high awareness levels for ads. I’d like to compare several podcast advertising platforms in this episode, and point out the differences between them. Not all ad platforms are created equal. So here’s my take on 3 platforms. Google AdWords is the 800 lbs gorilla. Can it work for podcasters? Generally speaking AdWords is expensive. So the question you’ll want to ask yourself is this: Can I afford driving traffic to my podcast at $5-$20 per click? How do you even know if your ads are reaching podcast listeners? On AdWords you cannot target podcast audiences easily. My own view is that you need measurable results for AdWords to make sense. For most businesses this means sending traffic to a good podcast landing page with a compelling reason to subscribe to their podcast. Often such landing pages features an incentive for subscribing to the podcast via email, for example a guide, gift, contest or give-away. At least these landing pages should collect email addresses. Using Google Ads to send cold traffic to iTunes and hoping that people subscribe is difficult to measure, and not worth it in my opinion. So we don’t use it except for certain corporate podcasts or non-profit podcasts in search of PR (as we are producing several). Some organizations have a PR budget, and promoting their show on AdWords seems appropriate for them. If you are promoting high ticket products, services or programs costing hundreds or thousands of dollars, then running a podcast advertising campaign costing $5-$20 per click may appear to make sense. But assuming that you can convert 3% of these clicks into podcast podcast listeners and subscribers, your cost per subscriber would be between $170 and $670. If you think that’s expensive, so do I. One example where AdWords could make sense is a Financial Investment and Trading Podcast. A client signing up to such a podcast and becoming a client later is worth many thousands of dollars. But for casual podcasts with a small budget I think Adwords are hardly ever worth pursuing. Facebook is one of the most affordable paid choices for promoting a podcast. It may seem easy to simply “boost” an episode specific post on your podcast site, and then hope people listen and subscribe. But I would not recommend this approach when first starting out. Instead, I would recommend sending traffic to your main podcast landing page that features an incentive for signing up. Where to Send Facebook Traffic? When you’re first starting with Facebook ads, you should send these ads to your podcast home page, not your episode pages. Do not simply boost your episode shared post on Facebook. This is because boosting an individual episode show notes post seems like a quick solution but rarely converts as well as a carefully crafted visual leading to a conversion optimized page. And your ad should be designed to specifically outline the listener benefit and value proposition of your overall podcast. Some podcasters promote on Facebook by sending traffic straight to their iTunes page. This makes no sense to me, since iTunes makes for a very poor landing page. By sending your valuable ad traffic to iTunes, you miss the opportunity to present the benefits of signing up for your podcast, and to capture an email subscriber in the process. Plus, from an SEO perspective, iTunes doesn’t need traffic or social signals, but your own site does. So let’s assume you are sending ad traffic to your own podcast homepage. You therefore want to ensure your podcast home page is optimized for conversion. We have a huge guide on podcast design patterns for conversion, I suggest you check it out. If you have a lead magnet or give-away specifically for each episode, Facebook can be a great way to take advantage of that. Your visual for the Facebook ad can focus on the lead magnet give away, instead of on static or boring podcast art. Your Facebook episode specific ads should make it clear that there is a “must have” lead magnet associated with the ad. The more your “lead magnet” is aligned with the topic of the episode, the better the conversion rates will be. A popular and effective way to gain podcast subscribers is by running a contest or give-away on Facebook. This used to be a popular podcast launch strategy. Contests were typically set up to ask for an iTunes review in exchange for entering the contest. However, the iTunes algorithms have changed since then. Reviews no longer play as much of a role in driving a podcast into the New and Noteworthy section. That said, contests can work for subscriber growth even after the initial launch period. The benefit here is that people entering your contest are providing their email address, and you can make it clear that by entering the contest your listeners are signing up for email notifications when new episodes launch. The prize for a contest does not need to be anything super expensive. But it should be aligned with the topic of the show. It is much more important that the prize is relevant. Take a Customer Experience podcast for example. Rather than giving away an iPad or some other expensive gadget, consider giving away tickets to the premiere Customer Experience Conference that year. If you were to give away an iPad you would get tons of meaningless content entries of people just fishing for an electronic gadget. But it you are giving away conference tickets, you can be sure that people entering your contest are interested in your topic, and thus ideal podcast subscribers. Here are some good Facebook Contest Resources. Heyo – Beautiful and easy to set up, including a free trial and affordable monthly rate after that. Wishpond – Lots of contest templates to choose from. Also includes a free trial. Shortstack – A platform for contests and quizzes. More options and a greater learning curve. Agora Pulse – Most affordable platform, and ROI focused. For a more complete review of Facebook Contest platforms, check out this in-depth review by Venture Harbor. While Facebook advertising is affordable and effective, it is also a pretty vast topic, requiring lots of expertise. We will do a deep dive into this in a future episode. Here are just some additional ideas on utilizing the Facebook ads platform. Facebook Messenger bots to invite people to subscribe or leave a review. These messenger bots result in you acquiring leads with emails. Installing Facebook Pixels on your site and re-targeting your site visitors to subscribe. Running Facebook ads to social share gates, using our favorite social share gate tool called “GoViral”. This saves you from having to create a landing page, and still results in people sharing your podcast pages with their Facebook audience in order to “unlock” your lead magnet offer. In-podcast advertising networks are so effective because by default, your entire audience consists of podcast listeners. One great way to get new listeners is to advertise on other existing podcasts in your niche. Most podcasters only think of podcast advertising networks as something to help them monetize their own show. But placing an ad inside one of the most popular podcasts in your niche can be super effective. 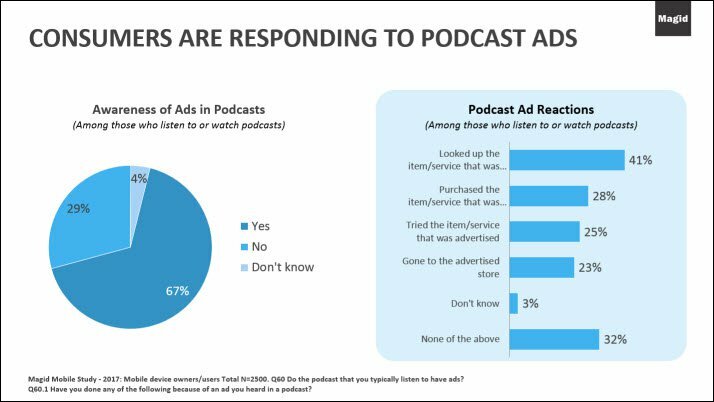 According to Midroll, 61% of podcast listeners have taken action and purchased or signed up for something from such podcast ads. Here is some information from Midroll, by far the best known podcast advertising network. So let’s do the math. If your ad is highly relevant to the audience of the podcast you place your ad into, and assuming 3% of listeners take action and subscribe to your show, your cost per new listener would be $0.83. If only 1% of listeners take action, then it would be $2.50 per subscriber. On the surface, these numbers compare very favorably to advertising on Facebook or AdWords. However, there is a rub: Podcast networks charge per download, and the number of downloads do not equal the number of listens. And in order for your in-podcast midroll ads to work, you need people to listen, right? How many downloads are actually listened to depends greatly on the type of podcast. A daily news podcast might have a much lower download to listen ration vs. a podcast with a loyal fan base. Just something to keep in mind. Here is a link to Midroll’s metrics, demographics and pricing, everything you need to know to advertise your own show on one of the best known podcast ad networks. Authentic is another podcast ad network with some compelling shows to advertise on, including the hit “Serial”. Archer Avenue works with you to ensure your ads are placed only on the shows you are interested in. They can also help you design an audio ad matching the style of the show you would be advertising on. Advertise Cast has an interesting tool to help you find podcasts to advertise on, as well as predict the total spend of your campaign. Look for the “filter” tool in the left sidebar of their site. You can set the Cost Per Thousand (CPM) downloads to display podcasts that match your budget, and then proceed to select shows that would be a good fit. Podgrid focuses on small to medium sized shows, and go the extra mile to match you with the best podcasts to advertise on. Because they are small, they work to match your budget. Thus I think they are a good choice if you want to experiment with a limited budget. Podcast One is a large network with 200 shows and “400 million impressions” according to their page. If placing ads on podcast networks seems intimidating, there is a good article on Adopter Media explaining podcast advertising rates and how they work. It answers the most common questions about how costs are determined and common pricing approaches. In order to figure out if this will work for your podcast and your budget, I would suggest the following: Study each podcast network website listed above. Remember that the best outcome results from being aligned with the show you are advertising on. Make a list of podcasts that would suit your niche and messaging. Set a budget you would be comfortable with for 1/2 year. Contact each network through their online form and describe what you are looking for. If your budget is limited, try the Podgrid network first. All of the podcast networks are very customer friendly. They offer consulting sessions to help you get started, and I’d suggest phone or Zoom meetings with each one to get a sense of how they work and how well aligned you are with their stable of available podcasts. All in all, I think I can summarize it like this. Facebook is the most versatile podcast advertising platform simply because it’s targeting flexibility and relative affordability. Podcast Ad Networks are the most effective way to get to existing podcast listeners, but require a decent budget. This episode reveals how “Podcast Guesting” is one of the best possible marketing strategies for podcasters. What is “Guesting”, And What Are the Benefits? Being a guest on other peoples podcasts is good PR – not just for podcasters. As a result there are several programs out there that teach why this is such an effective marketing approach for start-ups, authors, speakers and entrepreneurs to create PR and promote their business. Steve Olsher’s Profiting from Podcasts is a program for non-podcasters and podcasters alike to appear on other people’s shows. As part of his site he gives away “lead magnet”. This is a free directory and contact information for 670 podcasters whose show you could appear on. The tactical benefits are too many to count. Great for your SEO: Guest appearances on podcasts usually result in a back link to your business website. This is a big deal because links to your site are one of the most important ranking signal Google uses. So if you are podcasting as content strategy and want your show to appear in search results more easily, you’ve got to have links to your site. Each time you appear on someone else’s show, this is a likely outcome. It’s evergreen: while you are likely to get an initial boost, the episode you appear on will continue to exist. And will allow people to discover your own business or podcast. Above all, you can attract your ideal audience: people who listen to podcasts already. If listeners like you as a guest, they will check out your own show. We have seen this countless times. A great appearance on a popular show can skyrocket your own podcast subscriber base overnight, especially if your podcasting website is designed for conversion. If you can take your own message, mission and values and match it with that of your host’s podcast, you are attracting a super engaged audience. I mentioned Steve Olsher’s list of 600+ podcasts with contact info. Whatever you do, don’t abuse this list – for example by sending an impersonal mass email asking to be on 600 shows. Certainly your name will be dirt in the podcasting community if you do that! And this is true for generating a DIY list as well: There are ways you yourself can get contact info to outreach to people. But you will want to follow best practices and do your research ahead of time. So throughout this episode, we’ll point out best practices to follow to increase your success rate. Steve’s Olsher’s list features big podcasts with established audiences, and that’s great. However, don’t start there. Start with smaller players, if you are in a smaller niche yourself, and work your way up. To appear on the big shows, prove that you are worthy guest with a worthy message, and a large audience yourself. So instead, start with the smaller players in your field, and get practice. Having been a guest on other shows will help to get on the big shows later. You can use iTunes to research podcasts in your niche. Do some SEO keyword searches, locate podcasts that are good candidates for your own message, and look up the podcast website in the iTunes app. I recommend entering candidates in a Google Sheet. The results reveal several listicle posts about the top positivity podcasts to listen to. Perfect! Let’s drill down to examine each. Another good platform to research podcasts to appear on is Player.fm. This is because they list the number of subscribers on their platform, and this will show you how popular each one is. So, build a list of about 20 podcasts you would love to be on. We have a Google Sheets template for this process, and I am sharing a link to that at the bottom of this episode. Click here for that. The next stage in the process is to identify email addresses. The tool I am using is a Chrome extension called Hunter. Some podcast sites may only have a contact form, and that’s OK too, but the majority will reveal email addresses. Either you handle an outreach campaign by yourself, or you hire someone to do it for you. Several companies that specialize in arranging podcast guest appearances have sprung up in the last year or two, and this can save time. Here is are two quick start services that offers to do the hard work for you. You don’t get as much control about which podcasts you get to appear on. But I would recommend this in broader niches. For specific small niches, it might be more effective for you to start out doing research yourself. How would you like to have hundreds of podcast producers, hosts, and other media outlets contacting YOU to be a guest on their show? Their concept is that they will list you as a potential guest in their directory. So it is a way for podcast hosts and producers to find you. Get a 30-day listing for only $1. Subscription is $9.99/mo*. This premium service does a lot of the work for you, and can get you on some great shows. But it comes at a price of $750 a month. So depending on your situation, this may jump start your guesting efforts. Doing outreach campaigns yourself can be easy and is cost effective. But you need some time, a thick skin, and cannot have a low tolerance for rejection if you don’t want to spend a ton of money. I am assuming you are a resilient podcaster and entrepreneur here. The good news is that you will build reusable assets the first time you run a podcast guesting campaign. Each additional podcast guesting project will take less and less time. Because as a podcast producer we have seen tons of examples of people pitching us to be on one of our shows. 9 times out of 10 these are impersonal mass emails. Your opportunity here is to do the opposite and to do this right: research and personalize each time you reach out to someone. First, develop an email outreach template, and then heavily personalize it using the above research before you send it. What unique information can you teach their audience? Are there interesting stories their audience will benefit from hearing? Can you think of the most relevant advice and knowledge for your podcast host’s audience? Keep in mind that this template will need to only be created once, and has additional benefits. It could also serve for other outreach campaigns, such as guest posting and link building. We have a template for you to download in our resources section at the bottom of these show notes. Click here to access. Next, design a standing PR kit “One-Sheeter” for your podcast and add this as an attachment or separate section. This is another on-time only effort. Step #1: An enchanting subject line that grabs attention. Your subject line makes or breaks your pitch. Step #2: A personal greeting that builds a connection. Greet the show owner by name. Step #3: A killer opening that introduces you powerfully. Your opening lines should say who you are and why you’re writing. Share some popular podcasts you’ve been featured on. Brag about top industry blogs you’ve been featured on. Mention any notable press mentions if you have any. Reference an industry-related book if you’ve written any. State any industry awards you’ve won over the years. What if no one responds? Use TextExpander (or your emails built-in template system) to prepare and then personalize your podcast guesting outreach emails. This works great for one-at-a-time emails. 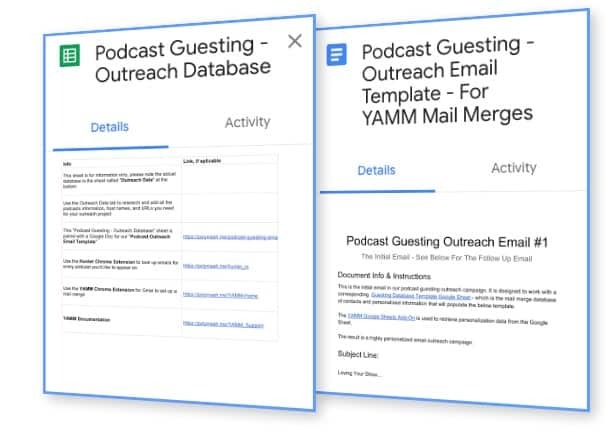 Use Chrome extensions like Hunter and YAMM to automate the outreach process so you can send campaigns to dozens if not hundreds podcast hosts. We demo this process in detail in the video at the top of this page, and in our downloadable guesting system at the bottom of these show notes. Use some sort of tracking system. We use a marketing automation platform called SharpSpring (think HubSpot but a fraction of the cost). But even so, there are free options to track. At least you will know if your recipient opened the email or not. Putting thought into the podcasts you appear on means thinking about the host on the other end of your interview. Again, you as a podcast know about this, right? Make it easy for your host, especially if you have never met. Follow the process they outline for you, if they ask you to use their tools and forms, go along with it. Make sure you listen to recent episodes of their show. Look up your host on their “about” page, and learn about them as a person, something you can weave into the conversation as appropriate. Be aware of the format and structure of the show you are appearing on. After your interview, support your host in the way you wished your own guests would. Reach out and thank your host, and offer your support in sharing the show notes. Ask if there is anything you can do to help create these, for example links, image and other information you should have already sent to the host in the form of your one-sheeter. Integration ready for use with YAMM mail merge tools so you can contact 100’s of podcast hosts – in a highly personalized way. UNLOCKED! Thanks for joining us! Here are the links, these are public read only documents on Google Sheets and Google Docs, just copy them to your own account to start using them. Be sure to watch the YAMM support instructions on how to set up a campaign. Be sure to just ask me any questions in the comments, or better even join our Facebook Discussion Group for Podcast Marketing as well! Podcast guesting may sound like a lot of work. But believe me, it is worth it. There are SEO services out there charging $500+ for a guest post article or back link from a reputable site. And this strategy is better. You will get an evergreen audio interview about your podcast and business, with a back-link to your site. You will also be speaking to and engaging a new audience that is already listening to podcasts and ready for your message and mission.